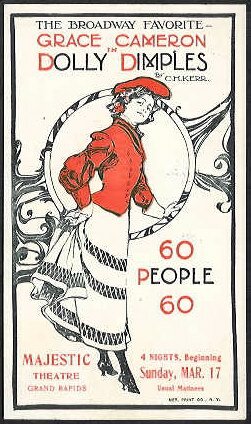 The theater was opened in 1903 as the Majestic Theater. It''s entrance and a portion of the lobby was built within a former storefront in a three story building on Division Ave. constructed in the 1870s. The actual auditorium was constructed behind at the corner of Sheldon Ave. and Library St. 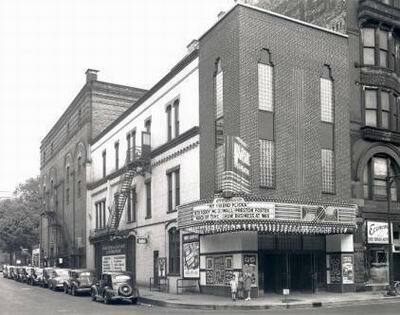 The main theater facade was later remodeled with red brick and glass block windows to replace the former Victorian era yellow brick tower at the corner of Library St. and Division. By its design, I surmise that this refacing was completed in the 1940s. Around that same time the Majestic was converted into a movie house. 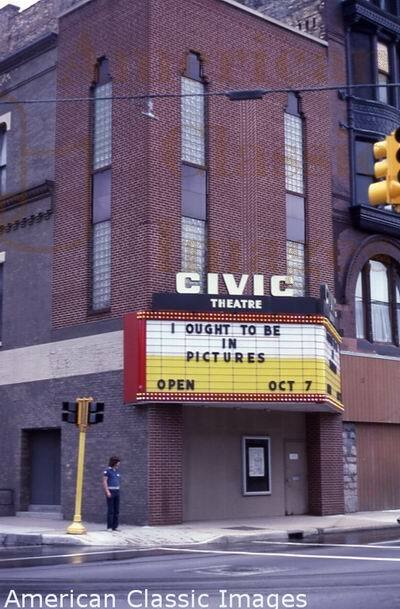 The Civic Theatre (the theatrical group not the building) got their start in 1920 as the Civic Players and were housed in numerous different theaters around Grand Rapids including the Ladies Literary Club and St. Cecilia Music Hall before moving into the Majestic Theater in 1974. At this time the building underwent a complete renovation which included closing off the original Division St. corner entrance and cutting a new entrance in the previously windowless wall on Library St. This change placed the entrance a long wall directly across from the doors into the auditorium and halved the size of the lobby. 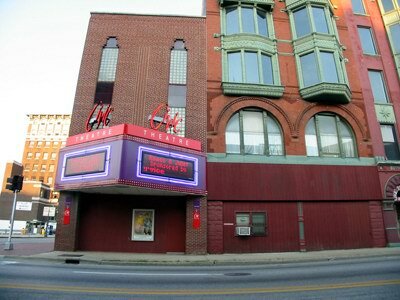 The three neighboring buildings on Division were bought and incorporated into the theater complex. These structures now house offices and The Civic School of Theatre Arts (opened in 1996). Upon the reopening in 1974, the name of the building was changed from Majestic to The Civic Theatre to reflect the name of the theatrical organization. Another complete renovation of the complex was started in 2005. Exterior updates included a modern reinterpretation of the original yellow brick tower on the Division facade as well as the reopening of the Division St. entrance and lobby. On the library St.
face, a glass atrium was extended out into the sidewalk to accommodate a coat room, enlarged lobby, and more efficient and attractive stairways to the balcony. 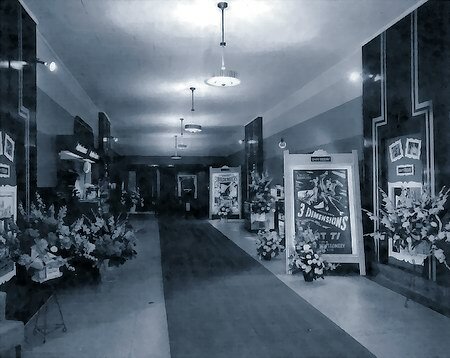 Inside, the auditorium was repainted from all white to a blue, yellow-beige, and maroon color scheme to be more in keeping with the time period of the theater. The exterior also received a bold new color scheme with brick of dark red, trim in golden yellow, and accents of deep blue-green. 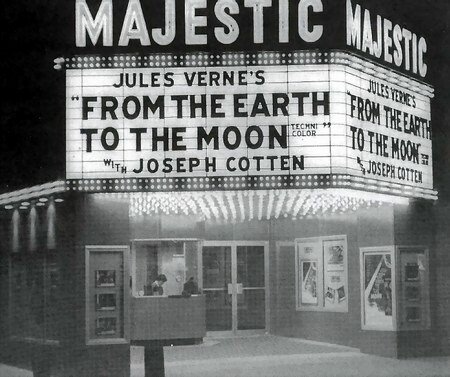 Along with the renovation, the official name of the building was changed to the Meijer Majestic Theater after major benefactor Fredrick Meijer. This name can be seen on the sides of the new Division Ave. marquee. The name of the theatrical group remains The Civic Theatre which appears in a much larger font on the front of the Marquee, on a new light-bulb trimmed vertical sign, as well as spelled out along the top of the glass atrium. Note: Grand Rapids Civic Theatre has a website which can be found here: http://www. I gave an insider's tour of the renovated theatre to videoblogger Josh Leo. His videos are posted at www. joshleo. com. The Civic Theatre, now celebrating its 77th season is one of the oldest community theatres in the country. 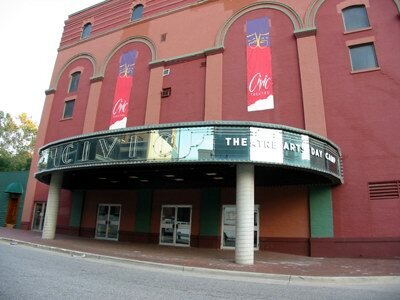 With more than 6,000 season ticket holders, it is the largest community theatre in the state of Michigan and the second largest in the United States. During a single season, the theatre reaches almost 100,000 people. Each season, there are six main stage productions, two productions for children, and various other special events around the community. The theatre is currently under the leadership of 12 professional staff, more than 30 guest artists, and numerous local volunteers. Large community theater produces a main stage season, theater for children and special events. Tickets can be purchased online.